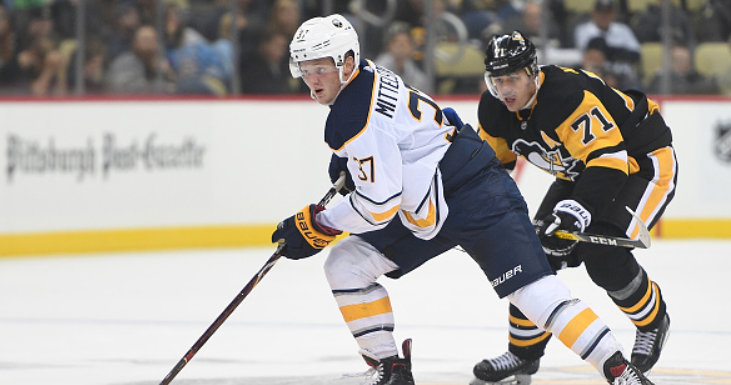 After ridding themselves of the goose eggs in the win column (vs. Rangers), the Buffalo Sabres look to string two, or more, together. Heading into today’s matinee (3pm. Also a Hi Sticking game. Play it on Twitter), the 31st place team from last season faces one that was in the Stanley Cup Finals. Despite matching records, the Vegas Golden Knights have proven to be a fast team, which is typically the achilles heel for Buffalo. The Sabres have acquired faster hockey players though it has not made game-play much better. Game 1 was horrendous while they scrapped by the New York Rangers in number 2. It will take more to get by the long shot that found its way to contending for the top prize. There is some truth to the fact that the Sabres have many new faces but that did not stop the Golden Knights last season. Vegas Coach Gerard Gallant, along with the help of GM George McPhee, somehow made an expansion team work. From the start, the combination of strong goaltending and speed had success against even the best of teams. Yet Phil Housley could not make it work with Jack Eichel on the roster. Yes, the Knights had mostly better players but they were from different teams and the bench boss found a solution. Housley has not shown proof of improved possession and passing just yet but he must lead his group to build off what has gone well in this regard. It may not be much but it is worth conveying this message. In all honestly, the most significant factor for defeating the Rangers on Saturday was Carter Hutton. As a team, the Sabres allowed too many chances against that the newest goaltender responded to well. He will likely be in goal this afternoon so I would not expect him to meet the barrage he faced last game and not allow 1 or 2 more. Sustaining offensive pressure and cleaner passing out of the d-zone can minimize the Vegas attack. This is a fairly difficult task due to the Knights’ speed so it should be a good test. Clean it up and get some dangerous chances the other way. The 19 year old has one assist to show but he has been one of the teams best passers through 2 games. Mittelstadt’s usage has been sheltered, with 72% o-zone starts at 11:04 TOI at 5-on-5 while keeping a 60% CorsiFor. Ben Mathewson of “Die by the Blade” posted a fine article on how the young center positively impacts the Sabres. He explains how most shifts had a significant, positive impact due to his strong decision making. It was not simply in the offensive zone either. With that being said, will he get at least 1 more minute at even strength? And will Mittelstadt be rewarded for his play with a goal? He has not quite broken out like Elias Pettersson through the start but it may not take long. With an underwhelming preseason, the former Gopher is showing improve confidence in his play and it will translate. Vegas 4-3 in OT: The game is up for grabs until the end. Sabres cannot quite reign in passes. Check out the 4th Line Hockey Podcast, available on iTunes, Google Podcasts, Stitcher and everywhere else podcasts are found!